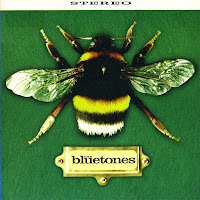 The Bluetones formed in 1994 in Hounslow, Greater London. The original members were Mark Morriss, Adam Devlin, Scott Morriss and Eds Chesters. Their biggest hit was 'Slight return', originally released as a double A-side single in 1995 with 'The fountainhead'. After this failed to chart, it was re-released a year later. This release was more successful: the single peaked at number 2 in the UK singles chart in March 1996. This single was pressed in a limited edition of 10,000 copies. I've got number 7352.